Kit Harington RUINED the Game of Thrones ending for his poor wife | SHEmazing! Kit Harington has some intriguing information, to say the least. He KNOWS THINGS we don't; namely the Game of Thrones ending. One of the biggest kept secrets in the entire universe, Kit has been carrying around some absolute bombs for months, and his poor wife has now been victim to the biggest one of all. 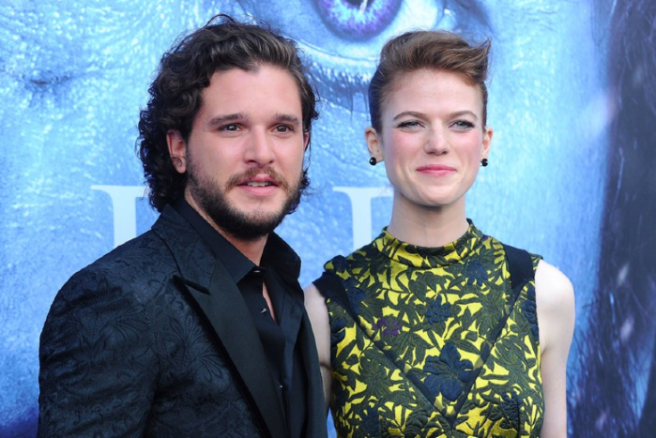 Jon Snow and Ygritte were (ARE) Game of Thrones' most tragic couple, and the real-life husband and wife are both highly invested in the show. They're one of the cutest celebrity couples in the business, especially because their love onscreen was SO DAMN PALPABLE. Harington has thanked the show in the past for bringing them together, speaking of how he fell in love with Rose after filming with her in Iceland. #KitHarrington uses emojis to drop hints about the #GameOfThrones final season! Rose is a major Game of Thrones fan, considering her past role in the show. Naturally, she was curious about how the show ends, most likely since her husband is now smooching the Mother of Dragons. She asked her hubby how she show ends, and he (stupidly) indulged her questions. BIG mistake, Kit. We're not quite sure if her reaction means that the ending is happy or tragic, but we're assuming tragic. George R. R. Martin and the showrunners are cruel men, they kill off everyone we love. Kit Harington previously said he was satisfied with the iconic HBO series' ending, but refused to say if he was happy or sad about it. So it's 100 percent sad. We're fairly sure Jon Snow isn't the only person to let slip TV's mother of all secrets. Sophie Turner, who plays Sansa Stark, also told her nearest and dearest the ending too. Would you tell your significant other, or parents, the finale spoilers? We probably would, TBH.